For 40 minutes, Victory was under fire from Héros, Santísima Trinidad, Redoutable, and Neptune; although many shots went astray, others killed and wounded a number of her crew and shot her wheel away, so that she had to be steered from her tiller belowdecks. Victory could not yet respond. At 12:45, Victory cut the enemy line between Villeneuve's flagship Bucentaure and Redoutable; she came close to Bucentaure, firing a devastating raking broadside through her stern which killed and wounded many on her gundecks. Villeneuve thought that boarding would take place, and with the Eagle of his ship in hand, told his men, "I will throw it onto the enemy ship and we will take it back there!" However Victory engaged the 74-gun Redoutable; Bucentaure was left to be dealt with by the next three ships of the British windward column: Temeraire, Conqueror, and HMS Neptune. At 13:55, Captain Lucas, of Redoutable, with 99 fit men out of 643 and severely wounded himself, surrendered. The French Bucentaure was isolated by Victory and Temeraire, and then engaged by HMS Neptune, HMS Leviathan, and Conqueror; similarly, Santísima Trinidad was isolated and overwhelmed, surrendering after three hours. 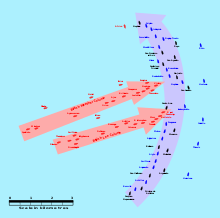 As more and more British ships entered the battle, the ships of the allied centre and rear were gradually overwhelmed. The allied van, after long remaining quiescent, made a futile demonstration and then sailed away. The British took 22 vessels of the Franco-Spanish fleet and lost none. Among the captured French ships were L'Aigle, Algésiras, Berwick, Bucentaure, Fougueux, Intrépide, Redoutable, and Swiftsure. The Spanish ships taken were Argonauta, Bahama, Monarca, Neptuno, San Agustín, San Ildefonso, San Juan Nepomuceno, Santísima Trinidad, and Santa Ana. Of these, Redoutable sank, and Santísima Trinidad and Argonauta were scuttled by the British. Achille exploded, Intrépide and San Augustín burned, and L'Aigle, Berwick, Fougueux, and Monarca were wrecked in a gale following the battle. The number is the order in the line. Soon after leaving port, the wind shifted to west-southwest, raising a heavy sea with the result that most of the British prizes broke their tow ropes, and drifting far to leeward, were only partially resecured. The combined squadron came in sight at noon, causing Collingwood to summon his most battle-ready ships to meet the threat. In doing so, he ordered them to cast off towing their prizes. He had formed a defensive line of ten ships by three o'clock in the afternoon and approached the Franco-Spanish squadron, covering the remainder of their prizes which stood out to sea. The Franco-Spanish squadron, numerically inferior, chose not to approach within gunshot and then declined to attack. Collingwood also chose not to seek action, and in the confusion of the powerful storm, the French frigates managed to retake two Spanish ships of the line which had been cast off by their British captors, the 112-gun Santa Ana and 80-gun Neptuno, taking them in tow and making for Cádiz. On being taken in tow, the Spanish crews rose up against their British prize crews, putting them to work as prisoners. —  Vice-Admiral Cuthbert Collingwood to the Admiralty, November 1805. Spanish military garrisons and civilians set out to rescue survivors from the numerous shipwrecks scattered along the Andalusian coast. British prize crews were captured and given good treatment. On 27 October, Collingwood offered the governor of Cádiz, to put his Spanish wounded prisoners ashore and set them free. The governor and Gravina offered in exchange to release their British prisoners, who boarded the British fleet. The French would later join this humanitarian agreement. Report of Spanish losses in the combat of 21 October. When Rosily arrived in Cadiz, he found only five French ships, rather than the 18 he was expecting. The surviving ships remained bottled up in Cadiz until 1808 when Napoleon invaded Spain. The French ships were then seized by the Spanish forces and put into service against France. The battle took place the day after the Battle of Ulm, and Napoleon did not hear about it for weeks—the Grande Armée had left Boulogne to fight Britain's allies before they could combine a huge force. He had tight control over the Paris media and kept the defeat a closely guarded secret for over a month, at which point newspapers proclaimed it to have been a tremendous victory. In a counter-propaganda move, a fabricated text declaring the battle a "spectacular victory" for the French and Spanish was published in Herald and attributed to Le Moniteur Universel. Following the battle, the Royal Navy was never again seriously challenged by the French fleet in a large-scale engagement. Napoleon had already abandoned his plans of invasion before the battle and they were never revived. The battle did not mean, however, that the French naval challenge to Britain was over. First, as the French control over the continent expanded, Britain had to take active steps with the Battle of Copenhagen in 1807 and elsewhere in 1808 to prevent the ships of smaller European navies from falling into French hands. This effort was largely successful, but did not end the French threat as Napoleon instituted a large-scale shipbuilding programme that had produced a fleet of 80 ships of the line at the time of his fall from power in 1814, with more under construction. In comparison, Britain had 99 ships of the line in active commission in 1814, and this was close to the maximum that could be supported. Given a few more years, the French could have realised their plans to commission 150 ships of the line and again challenge the Royal Navy, compensating for the inferiority of their crews with sheer numbers. For almost 10 years after Trafalgar, the Royal Navy maintained a close blockade of French bases and anxiously observed the growth of the French fleet. In the end, Napoleon's Empire was destroyed by land before his ambitious naval buildup could be completed. Nelson became – and remains – Britain's greatest naval war hero, and an inspiration to the Royal Navy, yet his unorthodox tactics were seldom emulated by later generations. The first monument to be erected in Britain to commemorate Nelson may be that raised on Glasgow Green in 1806, albeit possibly preceded by a monument at Taynuilt, near Oban in Scotland dated 1805, both also commemorating the many Scots crew and captains at the battle. The 144-foot-tall (44 m) Nelson Monument on Glasgow Green was designed by David Hamilton and paid for by public subscription. Around the base are the names of his major victories: Aboukir (1798), Copenhagen (1801) and Trafalgar (1805). The Nelson Monument overlooking Portsmouth was built in 1807-08 with money subscribed by sailors and marines who served at Trafalgar. In 1808, Nelson's Pillar was erected by leading members of the Anglo-Irish aristocracy in Dublin to commemorate Nelson and his achievements (between 10% and 20% of the sailors at Trafalgar had been from Ireland), and remained until it was destroyed in a bombing by "Old IRA" members in 1966. Nelson's Monument in Edinburgh was built between 1807 and 1815 in the form of an upturned telescope, and in 1853 a time ball was added which still drops at noon GMT to give a time signal to ships in Leith and the Firth of Forth. In summer this coincides with the one o'clock gun being fired. The Britannia Monument in Great Yarmouth was raised by 1819. Nelson's Column, Montreal began public subscriptions soon after news of the victory at Trafalgar arrived; the column was completed in the autumn of 1809 and still stands in Place Jacques Cartier. London's Trafalgar Square was named in honour of Nelson's victory; at the centre of the square there is a 45.1 m (148 ft) column, Nelson's Column, with a 5.5 m (18 ft) statue of Nelson on top. It was finished in 1843. The statue of Lord Nelson in Bridgetown, Barbados, in what was also once known as Trafalgar Square, was erected in 1813. "Trafalgar" (1873), a Spanish novel about the battle, written by Benito Pérez Galdós. It is a fictional account of a boy aboard the Santa Ana. The Battle of Trafalgar" is a 1911 silent short film directed by J. Searle Dawley. ^ Adkin 2007, p. 524. ^ a b Adkins 2004, p. 190. ^ "Napoleonic Wars". Westpoint.edu. U.S. Army. Archived from the original on 28 July 2014. Retrieved 1 July 2017. ^ Bennet, Geoffrey (2004). The Battle of Trafalgar. England: Pen & Sword Books Limited, CPI UK, South Yorkshire. ^ Kongstam, Angus (2003) . "The New Alexander". Historical Atlas of the Napoleonic Era. London: Mercury Books. p. 46. ISBN 1904668046. 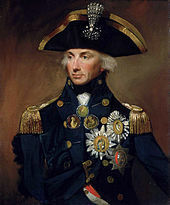 ^ When offered his pick from the Navy List by Lord Barham (the First Lord of the Admiralty), Nelson replied "Choose yourself, my lord, the same spirit actuates the whole profession; you cannot choose wrong" (Allen 1853, p. 210). ^ Admirals of the time, due to the slowness of communications, were given considerable autonomy to make strategic as well as tactical decisions. ^ Schom 1990, pp. 301–06. 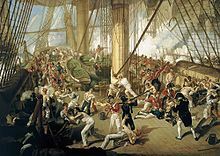 ^ "The Battle of Trafalgar: The Logbook of the Euryalus, 21st October 1805". chasingnelson.blogspot.co.uk. 22 October 2013. Retrieved 11 June 2017. ^ a b Adkins 2004a, p. [page needed]. ^ a b "England Expects". aboutnelson.co.uk. Retrieved 16 September 2006. ^ "England Expects". The Nelson Society. Archived from the original on 24 March 2005. Retrieved 24 March 2005. ^ "Auguste Mayer's picture as described by the official website of the Musée national de la Marine (in French)". Musee-marine.fr. Archived from the original on 26 May 2010. Retrieved 6 March 2011. ^ Fraser 1906, pp. 114, 211–13. ^ a b Hibbert 1994, p. 376. ^ a b c Adkin 2007, p. 530. ^ a b Craig, Phil; Clayton, Tim; Craig, Tim Clayton & Phil (2012). Trafalgar: The men, the battle, the storm. Hodder & Stoughton. ISBN 9781444719772. ^ a b Yonge 1863, p. 335. ^ a b Fremont-Barnes 2005, p. 81. ^ Fremont-Barnes 2005, p. 82. ^ Pocock 2005, p. 175. ^ a b c Yonge 1863, p. 336. ^ Tracy 2008, p. 249. ^ Ward, Prothero & Leathers 1906, p. 234. ^ Rodríguez González, Agustín Ramón (20 October 2015). "El epílogo de Trafalgar". Espejo de navegantes (in Spanish). Retrieved 21 October 2018. ^ Reeve's Naval General Service Medal with Trafalgar clasp and Muster List for HMS Victory are on show at the Royal Marines Museum, Southsea, Britain (BBC staff 2008). ^ Adkins, Roy (2004). Trafalgar (2010 ed.). Abacus. p. 279. ISBN 978-0-349-11632-7. ^ See for example: NC staff (July – December 1805). "First Bulletin of the Grand Naval Army [From the Moniteur] As it appeared in the Herald. Battle of Trafalgar". Naval Chronicle. Fleet Street, London: J. Gold. 14. cited by ACS staff 2009. ^ Westmacott, Charles Molloy; Jones, Stephen (1806). The Spirit of the Public Journals: Being an Impartial Selection of the Most Exquisite Essays and Jeux D'esprits, Principally Prose, that Appear in the Newspapers and Other Publications, Volume 9. James Ridgeway. p. 322. Retrieved 27 March 2015. Footnote of one claim: "This turned out to be really afferted afterwards by the French newspapers". The authors hence believe the rest to be a fabrication. ^ Harding 1999, pp. 96–117. ^ Glover 1967, pp. 233–52. ^ Nicolson 2005, p. 9–10. ACS staff (2009). 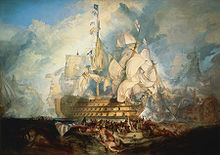 "Battle of Trafalgar – propaganda". The Archives and Collections Society. Retrieved 15 March 2009. Adkin, Mark (2005). The Trafalgar Companion: A Guide to History's Most Famous Sea Battle and the Life of Admiral Lord Nelson. London: Aurum Press. ISBN 1-84513-018-9. Adkins, Roy (2004). Trafalgar: The Biography of a Battle. Little Brown. ISBN 0-316-72511-0. Adkins, Roy (2004a). Nelson's Trafalgar (1st ed.). London: Penguin Books. ISBN 9780143037958. Adkins, Roy; Adkins Lesley (2006). The War For All The World's Oceans. Lancaster Place, London. : Little, Brown Book Group. ISBN 0-316-72837-3. Allen, Joseph (1853). Life of Lord Viscount Nelson. George Routledge. p. 210. Best, Nicholas (2005) . Trafalgar. London: Weidenfeld & Nicolson. ISBN 0 297 84622 1. Cowan, Veronica (21 December 2005). "First Sea Lord Admiral Sir Alan West on Trafalgar 2005". Culture24. Retrieved 1 February 2012. Elmundo staff (21 October 2005). 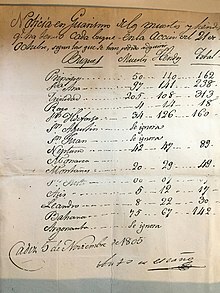 "Los países que combatieron en Trafalgar homenajean a sus caídos en el 200 aniversario de la batalla (Countries that fought at Trafalgar pay tribute to their fallen on the 200th anniversary of the battle)" (in Spanish). Elmundo.es. Fremont-Barnes, Gregory (2007) . The Royal Navy, 1793–1815. Oxford: Osprey Publishing. ISBN 978 1 84603 138 0. Fremont-Barnes, Gregory (2005). 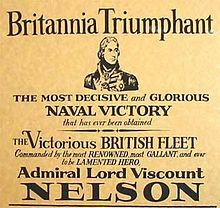 Trafalgar 1805: Nelson's Crowning Victory. Hook, Christa (Illust.). Osprey Publishing. ISBN 1-84176-892-8. Glover, Richard (1967). 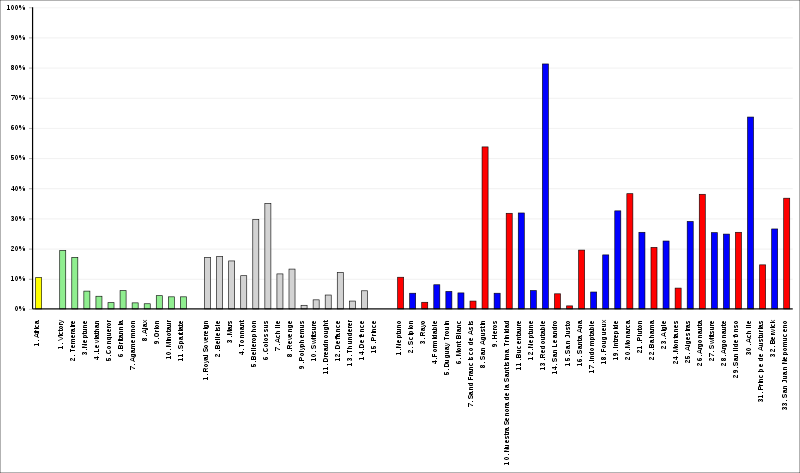 "The French Fleet, 1807–1814; Britain's Problem; and Madison's Opportunity". The Journal of Modern History. 39 (3): 233–52. doi:10.1086/240080. Harding, Richard (1999). "Naval Warfare 1453–1815". In Black, Jeremy (ed.). European Warfare 1453–1815. Hampshire: Palgrave MacMillian. pp. 96–117. ISBN 978-0-333-69223-3. Hibbert, Christopher (1995). Nelson: A Personal History. Basic Books. p. 472. ISBN 0-201-40800-7. Ireland, Bernard (2000). Naval Warfare in the Age of Sail. Hammersmith, London. : Harper Collins Publishing. ISBN 0-00-762906-0. Lavery, Brian (2009) . Empire of the Seas. London: Conway Publishing. ISBN 9781844861095. Lee, Christopher (2005) . Nelson and Napoleon. London: Headline Book Publishing. ISBN 0 7553 1041 1. MercoPress staff (4 June 2005). "Majestic Royal Navy display in Faslane". Falkland Islands: MercoPress. Retrieved 1 February 2012. Nicolson, Adam (2005). Men of Honour: Trafalgar and the Making of the English Hero (U.S. title Seize the Fire: Heroism, Duty, and the Battle of Trafalgar). Harper Collins. ISBN 0-00-719209-6. Pocock, Tom (2005). Trafalgar: an eyewitness history. Penguin Classics. ISBN 0-14-144150-X. Poppyland staff (2012). "Poppyland Activity 1: Nelson's Crew at Trafalgar". Poppyland.co.uk. Retrieved 4 February 2009. Schom, Alan (1990). Trafalgar: Countdown to Battle, 1803–1805. New York. ISBN 0-689-12055-9. Spicer, Graham (3 August 2005). "England expects – on the trail of Admiral Lord Nelson". Culture24. Retrieved 1 February 2012. TB staff. "La Batalla de Trafalgar. Lo que queda tras la batalla (The Battle of Trafalgar. What remains after the battle)". Todo a Babor (in Spanish). Tracy, Nicholas (2008). Nelson's Battles: The Triumph of British Seapower (illustrated, revised ed.). Naval Institute Press. ISBN 978-1-59114-609-4. Ward, A.W. ; Prothero, G.W. ; Leathers, Stanley, eds. (1906). The Cambridge Modern History. IX. Cambridge University Press. p. 234. White, Colin (2005). Nelson the Admiral. Phoenix Mill, Stroud, Glos. : Sutton Publishing Limited. ISBN 0-7509-3713-0. White, Colin (2002). The Nelson Encyclopaedia. Park House, Russell Gardens, London. : Chatham Publishing, Lionel Leventhal Limited. ISBN 1-86176-253-4. Yonge, Charles D (1863). 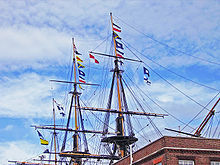 The history of the British navy: From the earliest period to the present time. II. This article incorporates text from a publication now in the public domain: Hanny, David (1911). "Trafalgar, Battle of" . In Chisholm, Hugh (ed.). Encyclopædia Britannica. 27 (11th ed.). Cambridge University Press. pp. 153–155. Clayton, Tim; Craig, Phil. Trafalgar: The Men, the Battle, the Storm. Hodder & Stoughton. ISBN 0-340-83028-X. Gardiner, Robert (2006). The campaign of Trafalgar, 1803–1805. Mercury Books. ISBN 1-84560-008-8. Warwick, Peter (2005). Voices from the Battle of Trafalgar. David & Charles Publishing. ISBN 0-7153-2000-9. BBC staff (21 October 2008). "Hero's medal marks Trafalgar Day". BBC News. Archived from the original on 11 January 2009. Retrieved 6 January 2009.